For the spider ranging from southeastern California to Arizona, see desert recluse. For the spider inhabiting Hawaii, see Mediterranean recluse spider. 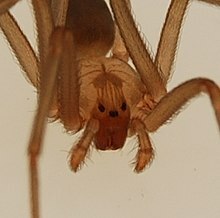 The brown recluse, Loxosceles reclusa, Sicariidae (formerly placed in a family "Loxoscelidae") is a recluse spider with a necrotic venom. Similar to other recluse spider bites, their bite sometimes requires medical attention. The brown recluse is one of three spiders (the others being black widow and Loxosceles laeta, the Chilean recluse) with medically significant venom in North America. The violin pattern is not diagnostic, as other spiders can have similar markings (e.g. cellar spiders and pirate spiders). For definitive identification, it is imperative to examine the eyes. While most spiders have eight eyes, recluse spiders have six eyes arranged in pairs (dyads) with one medial pair and two lateral pairs. Only a few other spiders have three pairs of eyes arranged in this way (e.g., scytodids). Recluses have no obvious coloration patterns on the abdomen or legs, and the legs lack spines. The abdomen is covered with fine short hairs that, when viewed without magnification, give the appearance of soft fur. The leg joints may appear to be a slightly lighter color. Adult brown recluse spiders often live about one to two years. Each female produces several egg sacs over a period of two to three months, from May to July, with approximately fifty eggs in each sac. The eggs hatch in about one month. The spiderlings take about one year to grow to adulthood. The brown recluse spider is resilient and can tolerate up to six months of extreme drought and scarcity or absence of food. On one occasion, a brown recluse survived in controlled captivity for over five seasons without any food at all. A brown recluse's stance on a flat surface is usually with all legs radially extended. When alarmed it may lower its body, withdraw the forward two legs straight rearward into a defensive position, withdraw the rearmost pair of legs into a position for lunging forward, and stand motionless with pedipalps raised. The pedipalps in mature specimens are dark and quite prominent and are normally held horizontally forward. When threatened it usually flees, seemingly to avoid a conflict, and if detained may further avoid contact with quick horizontal rotating movements or even resort to assuming a lifeless pose (playing dead). The spider does not usually jump unless touched brusquely, and even then its avoidance movement is more of a horizontal lunge rather than a vaulting of itself entirely off the surface. When running, the brown recluse does not leave a silk line behind, which would make it more easily tracked when it is being pursued. Movement at virtually any speed is an evenly paced gait with legs extended. When missing a leg or two it appears to favor this same gait, although (presumably when a leg has been injured) it may move and stand at rest with one leg slightly withdrawn. During travel it stops naturally and periodically when renewing its internal hydraulic blood pressure that, like most spiders, it requires to renew strength in its legs. Brown recluse spiders build asymmetrical (irregular) webs that frequently include a shelter consisting of disorderly thread. They frequently build their webs in woodpiles and sheds, closets, garages, plenum spaces, cellars, and other places that are dry and generally undisturbed. When dwelling in human residences they seem to favor cardboard, possibly because it mimics the rotting tree bark which they inhabit naturally. Human-recluse contact often occurs when such isolated spaces are disturbed and the spider feels threatened. Unlike most web weavers, they leave these lairs at night to hunt. Males move around more when hunting than the females, which tend to remain nearer to their webs. The range lies roughly south of a line from southeastern Nebraska through southern Iowa, Illinois, and Indiana to southwestern Ohio. 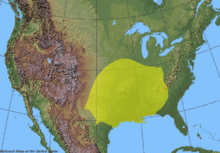 In the southern states, it is native from central Texas to western Georgia and north to Kentucky. Despite rumors to the contrary, the brown recluse spider has not established itself in California or anywhere outside its native range. This directly contradicts numerous sensationalized media reports of bites occurring where these spiders are absent (and no specimens were found), such as a 2014 report from Thailand, where a man was claimed to have died from a brown recluse bite. Over the last century, occasional spiders have been intercepted in various locations where they have no known established populations; these spiders may be transported fairly easily, though the lack of established populations well outside the natural range also indicates that such movement has not led to colonization of new areas, after decades of opportunities. Note that the occurrence of brown recluses in a single building (such as a warehouse) outside of the native range is not considered a successful colonization; such single-building populations can occur (e.g., in several such cases in Florida), but do not spread, and can be easily eradicated. 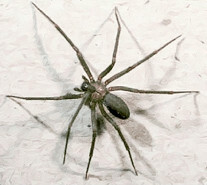 There are other species of the genus Loxosceles native to the southwestern part of the United States, including California, that may resemble the brown recluse, but interactions between humans and the recluse species in California and the region are rare because those species native ranges lie outside of dense human populations. The number of "false positive" reports based on misidentifications is considerable; in a nationwide study where people submitted spiders that they thought were brown recluses, of 581 from California only 1 was a brown recluse—submitted by a family that moved from Missouri and brought it with them (compared to specimens submitted from Missouri, Kansas, and Oklahoma, where between 75% and 90% were recluses). From this study, the most common spider submitted from California as a brown recluse was in the genus Titiotus, whose bite is deemed harmless. A similar study documented that various arachnids were routinely misidentified by physicians, pest control operators, and other non-expert authorities, who told their patients or clients that the spider they had was a brown recluse when in fact it was not. Despite the absence of brown recluses from the Western U.S., physicians in the region commonly diagnose "brown recluse bites", leading to the popular misconception that the spiders inhabit those areas. The bite frequently is not felt initially and may not be immediately painful, but it can be serious. The brown recluse bears a potentially deadly hemotoxic venom. Most bites are minor with no necrosis. However, a small number of brown recluse bites do produce severe dermonecrotic lesions (i.e. necrosis); an even smaller number produce severe cutaneous (skin) or viscerocutaneous (systemic) symptoms. In one study of clinically diagnosed brown recluse bites, skin necrosis occurred 37% of the time, while systemic illness occurred 14% of the time. In these cases, the bites produced a range of symptoms common to many members of the genus Loxosceles known as loxoscelism, which may be cutaneous and viscerocutaneous. In very rare cases, bites can even cause hemolysis—the bursting of red blood cells. 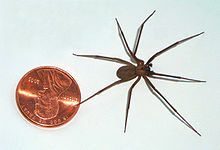 As suggested by its specific epithet reclusa (recluse), the brown recluse spider is rarely aggressive, and bites from the species are uncommon. In 2001, more than 2,000 brown recluse spiders were removed from a heavily infested home in Kansas, yet the four residents who had lived there for years were never harmed by the spiders, despite many encounters with them. The spider usually bites only when pressed against the skin, such as when tangled within clothes, towels, bedding, inside work gloves, etc. Many human victims report having been bitten after putting on clothes that had not been worn recently, or had been left for many days undisturbed on the floor. The fangs of the brown recluse are not large enough to penetrate most fabric. When both types of loxoscelism do result, systemic effects may occur before necrosis, as the venom spreads throughout the body in minutes. Children, the elderly, and the debilitatingly ill may be more susceptible to systemic loxoscelism. The systemic symptoms most commonly experienced include nausea, vomiting, fever, rashes, and muscle and joint pain. Rarely, such bites can result in hemolysis, thrombocytopenia, disseminated intravascular coagulation, organ damage, and even death. Most fatalities are in children under the age of seven or those with a weak immune system. While the majority of brown recluse spider bites do not result in any symptoms, cutaneous symptoms occur more frequently than systemic symptoms. In such instances, the bite forms a necrotizing ulcer as the result of soft tissue destruction and may take months to heal, leaving deep scars. These bites usually become painful and itchy within 2 to 8 hours. Pain and other local effects worsen 12 to 36 hours after the bite, and the necrosis develops over the next few days. Over time, the wound may grow to as large as 25 cm (10 inches). The damaged tissue becomes gangrenous and eventually sloughs away. There is now an ELISA-based test for brown recluse venom that can determine whether a wound is a brown recluse bite, although it is not commercially available and not in routine clinical use. Clinical diagnoses often use Occam's razor principle in diagnosing bites based on what spiders the patient likely encountered and previous similar diagnoses. A new mnemonic device, "NOT RECLUSE", has been suggested as a tool to help laymen and medical professionals more objectively screen and diagnose potential cases of loxoscelism. Many of these conditions are far more common and more likely to be the source of necrotic wounds, even in areas where brown recluse spiders actually occur. The most important of these is methicillin-resistant Staphylococcus aureus (MRSA), a bacterium whose necrotic lesions are very similar to those induced by recluse bites, and which can be lethal if left untreated. Misdiagnosis of MRSA as spider bites is extremely common (nearly 30% of patients with MRSA reported that they initially suspected a spider bite), and can have fatal consequences. Reported cases of brown recluse bites occur primarily in Arkansas, Colorado, Kansas, Missouri, Nebraska, Oklahoma, and Texas. There have been many reports of brown recluse bites in California—though a few related species may be found there, none of these are known to bite humans. To date, the reports of bites from areas outside of the spider's native range have been either unverified, or, if verified, the spiders have been moved to those locations by travelers or commerce. Many arachnologists believe that a large number of bites attributed to the brown recluse in the West Coast are either from other spider species or not spider bites at all. For example, the venom of the hobo spider, a common European species established in the northwestern United States and southern British Columbia, has been reported to produce similar symptoms as the brown recluse bite when injected into laboratory rabbits. However, the toxicity of hobo spider venom has been called into question as actual bites have not been shown to cause necrosis, and no such occurrences have ever been reported where the spider is native. First aid involves the application of an ice pack to control inflammation and prompt medical care. If it can be easily captured, the spider should be brought with the patient in a clear, tightly closed container so it may be identified. Routine treatment should include immobilization of the affected limb, application of ice, local wound care, and tetanus prophylaxis. Many other therapies have been used with varying degrees of success, including hyperbaric oxygen, dapsone, antihistamines (e.g., cyproheptadine), antibiotics, dextran, glucocorticoids, vasodilators, heparin, nitroglycerin, electric shock, curettage, surgical excision, and antivenom. None of these treatments have been subjected to randomized controlled trials to conclusively show benefit. In almost all cases, bites are self-limited and typically heal without any medical intervention. Outpatient palliative care following discharge often consists of a weak or moderate strength opioid (e.g. codeine or tramadol, respectively) depending on pain scores, an anti-inflammatory agent (e.g. naproxen, cortisone), and an antispasmodic (e.g. cyclobenzaprine, diazepam), for a few days to a week. If the pain and/or spasms have not resolved by this time, a second medical evaluation is generally advised, and differential diagnoses may be considered. Occasionally, an antibiotic is prescribed as well. Cases of brown recluse venom travelling along a limb through a vein or artery are rare, but the resulting tissue mortification can affect an area as large as several inches and in extreme cases require excising of the wound. In presumed cases of recluse bites, dapsone is often used for the treatment of necrosis, but controlled clinical trials have yet to demonstrate efficacy. However, dapsone may be effective in treating many "spider bites" because many such cases are actually misdiagnosed microbial infections. There have been conflicting reports about its efficacy in treating brown recluse bites, and some have suggested it should no longer be used routinely, if at all. Wound infection is rare. Antibiotics are not recommended unless there is a credible diagnosis of infection. Studies have shown that surgical intervention is ineffective and may worsen outcome. Excision may delay wound healing, cause abscesses, and lead to scarring. Antivenom is available in South America for the venom of related species of recluse spiders. However, the bites, often being painless, usually do not present symptoms until 24 or more hours after the event, possibly limiting the effect of this intervention. Due to increased fear of these spiders prompted by greater public awareness of their presence in recent years, extermination of domestic brown recluses is performed frequently in the lower midwestern United States. Brown recluse spiders possess a variety of adaptive abilities, including the ability to maintain homeostasis for several seasons with no food or water. Additionally, these spiders survive significantly longer in a relatively cool, thermally stable environment. ^ Vetter R; Shay, M; Bitterman, O (1999). "Identifying and misidentifying the brown recluse spider". Dermatol Online J. 5 (2): 7. doi:10.2340/00015555-0082. PMID 10673460. ^ Horner NV, Stewart KW (1967). "Life history of the brown spider, Loxosceles reclusa, Gertsch and Muliak". Texas Journal of Science. 19: 333. ^ Jone SC. "Ohio State University Fact Sheet: Brown Recluse Spider". Archived from the original on 2012-07-16. Retrieved 2006-02-18. ^ a b c d Swanson D, Vetter R (2005). "Bites of brown recluse spiders and suspected necrotic arachnidism". N Engl J Med. 352 (7): 700–7. doi:10.1056/NEJMra041184. PMID 15716564. ^ a b c Vetter, Rick. "Myth of the Brown Recluse: Fact, Fear, and Loathing". Retrieved 2008-05-02. ^ "1st Thai death from recluse spider". Bangkok Post. Retrieved 30 September 2014. ^ Palmer, Diane. "Brown recluse spiders blamed for more wounds than they inflict, study suggests". Clemson University Public Service Activities. Retrieved 12 September 2007. ^ Vetter, R.S. ; Edwards, G.B. ; James, L.F. (2004). "Reports of envenomation by brown recluse spiders (Araneae: Sicariidae) outnumber verifications of Loxosceles spiders in Florida". J. Med. Entomol. 41 (4): 593–597. doi:10.1603/0022-2585-41.4.593. ISSN 0022-2585. PMID 15311449. ^ Edwards, G.B. 2001. The present status and a review of the Brown Recluse and related spiders, Loxosceles spp. (Araneae: Sicariidae), in Florida. Entomology Circular #406, Fla. Dept. Agric. & Consumer Services Division of Plant Industry. 6 pp. ^ Vetter, R.S. (2005). "Arachnids submitted as suspected brown recluse spiders (Araneae: Sicariidae): Loxosceles species are virtually restricted to their known distributions but public perception is that they exist throughout the United States". J. Med. Entomol. 42 (4): 512–521. doi:10.1603/0022-2585(2005)042[0512:ASASBR]2.0.CO;2. ISSN 0022-2585. PMID 16119538. ^ Vetter, R.S. (2009). "Arachnids misidentified as brown recluse spiders by medical personnel and other authorities in North America". Toxicon. 54 (4): 545–547. doi:10.1016/j.toxicon.2009.04.021. PMID 19446575. ^ Vetter, R.S. ; Cushing, P.E. ; Crawford, R.L. ; Royce, L.A. (2003). "Diagnoses of brown recluse spider bites (loxoscelism) greatly outnumber actual verifications of the spider's presence in four western American states". Toxicon. 42 (4): 413–418. doi:10.1016/S0041-0101(03)00173-9. PMID 14505942. ^ a b Leach J, Bassichis B, Itani K (July 2004). "Brown recluse spider bites to the head: three cases and a review". Ear Nose Throat J. 83 (7): 465–70. PMID 15372917. , in turn citing: Wright, SW; Wrenn, KD; Murray, L; Seger, D (1997). "Clinical presentation and outcome of brown recluse spider bite". Ann Emerg Med. 30 (1): 28–32. doi:10.1016/s0196-0644(97)70106-9. PMID 9209221. ^ "Greta Binford 1997-". Biography Today. 17 (1): 14. 2007. ISSN 1058-2347. ^ Vetter, Richard S.; Barger, Diane K. (November 2002). "An Infestation of 2,055 Brown Recluse Spiders (Araneae: Sicariidae) and No Envenomations in a Kansas Home: Implications for Bite Diagnoses in Nonendemic Areas" (PDF). J. Med. Entomol. 39 (6): 948–951. doi:10.1603/0022-2585-39.6.948. PMID 12495200. ^ Robison, Mark (28 June 2011). "Fact Checker: Is that a brown recluse in your bathtub?". Reno Gazette-Journal. Retrieved 22 May 2013. ^ Sandidge, J.S. (2009). Brown recluse spiders: A knowledge based guide to control and elimination. McLouth: BRS Pest Control. ^ Wasserman G (2005). "Bites of the brown recluse spider". N Engl J Med. 352 (19): 2029–30, author reply 2029–30. doi:10.1056/NEJM200505123521922. PMID 15892198. ^ "Tenn. Boy Ruled Killed by Spider Bite". MSNBC.com. MSNBC Wire Services. Archived from the original on 2007-03-13. ^ Wasserman G, Anderson P (1983–1984). "Loxoscelism and necrotic arachnidism". J Toxicol Clin Toxicol. 21 (4–5): 451–72. doi:10.3109/15563658308990434. PMID 6381752. ^ Gomez H, Krywko D, Stoecker W (2002). "A new assay for the detection of Loxosceles species (brown recluse) spider venom". Annals of Emergency Medicine. 39 (5): 469–74. doi:10.1067/mem.2002.122914. PMC 3201721. PMID 11973553. ^ Osterhoudt KC, Zaoutis T, Zorc JJ (2002). "Lyme disease masquerading as brown recluse spider bite". Annals of Emergency Medicine. 39 (5): 558–61. doi:10.1067/mem.2002.119509. PMID 11973566. ^ Moran, GJ; et al. (2006). "Methicillin-resistant S. aureus infections among patients in the emergency department". New England J. Med. 355 (7): 666–74. doi:10.1056/nejmoa055356. PMID 16914702. ^ Vetter R, Isbister G (2004). "Do hobo spider bites cause dermonecrotic injuries?". Annals of Emergency Medicine. 44 (6): 605–7. doi:10.1016/j.annemergmed.2004.03.016. PMID 15573036. ^ Vetter, R.S. (2008). "Spiders of the genus Loxosceles (Araneae, Sicariidae): a review of biological, medical and psychological aspects regarding envenomations". The Journal of Arachnology. 36: 150–163. doi:10.1636/RSt08-06.1. ^ Bennett RG, Vetter RS (August 2004). "An approach to spider bites. Erroneous attribution of dermonecrotic lesions to brown recluse or hobo spider bites in Canada" (PDF). Canadian Family Physician. 50 (8): 1098–101. PMC 2214648. PMID 15455808. ^ James H. Diaz, MD (April 1, 2005). "Most necrotic ulcers are not spider bites". American Journal of Tropical Medicine and Hygiene. 72 (4): 364–367. doi:10.4269/ajtmh.2005.72.364. ^ Isbister GK, Gray MR (August 2003). "White-tail spider bite: a prospective study of 130 definite bites by Lampona species". The Medical Journal of Australia. 179 (4): 199–202. PMID 12914510. ^ Isbister GK, Hirst D (August 2003). "A prospective study of definite bites by spiders of the family Sparassidae (huntsmen spiders) with identification to species level". Toxicon. 42 (2): 163–71. doi:10.1016/S0041-0101(03)00129-6. PMID 12906887. ^ Maynor ML, Moon RE, Klitzman B, Fracica PJ, Canada A (March 1997). "Brown recluse spider envenomation: a prospective trial of hyperbaric oxygen therapy". Acad Emerg Med. 4 (3): 184–92. doi:10.1111/j.1553-2712.1997.tb03738.x. PMID 9063544. ^ Maynor ML, Abt JL, Osborne PD (1992). "Brown Recluse Spider Bites: Beneficial Effects of Hyperbaric Oxygen". J. Hyperbaric Med. 7 (2): 89–102. ISSN 0884-1225. Retrieved 2008-07-22. ^ Elston, DM; Miller, SD; Young, RJ; Eggers, J; McGlasson, D; Schmidt, WH; Bush, A (2005). "Comparison of colchicine, dapsone, triamcinolone, and diphenhydramine therapy for the treatment of brown recluse spider envenomation: a double-blind, controlled study in a rabbit model". Arch Dermatol. 141 (5): 595–7. doi:10.1001/archderm.141.5.595. PMID 15897381. ^ Vetter R, Bush S (2002). "The diagnosis of brown recluse spider bite is overused for dermonecrotic wounds of uncertain etiology". Annals of Emergency Medicine. 39 (5): 544–6. doi:10.1067/mem.2002.123594. PMID 11973562. ^ Bryant S, Pittman L (2003). "Dapsone use in Loxosceles reclusa envenomation: is there an indication?". Am J Emerg Med. 21 (1): 89–90. doi:10.1053/ajem.2003.50021. PMID 12563594. ^ Anderson P (1998). "Missouri brown recluse spider: a review and update". Missouri Medicine. 95 (7): 318–22. PMID 9666677. ^ Rees R, Altenbern D, Lynch J, King L (1985). "Brown recluse spider bites. A comparison of early surgical excision versus dapsone and delayed surgical excision". Ann Surg. 202 (5): 659–63. doi:10.1097/00000658-198511000-00020. PMC 1250983. PMID 4051613. ^ Burton K. "The Brown Recluse Spider: Finally stopped in its tracks". Archived from the original on 2006-04-20. Retrieved 2006-09-02. ^ Lowry B, Bradfield J, Carroll R, Brewer K, Meggs W (2001). "A controlled trial of topical nitroglycerin in a New Zealand white rabbit model of brown recluse spider envenomation". Annals of Emergency Medicine. 37 (2): 161–5. doi:10.1067/mem.2001.113031. PMID 11174233. ^ Isbister G, Graudins A, White J, Warrell D (2003). "Antivenom treatment in arachnidism". J Toxicol Clin Toxicol. 41 (3): 291–300. doi:10.1081/CLT-120021114. PMID 12807312. ^ Sandidge JS, Hopwood JL (2005). "Brown Recluse Spiders: A Review of Biology, Life History and Pest Management". Transactions of the Kansas Academy of Science. 108 (3/4): 99–108. doi:10.1660/0022-8443(2005)108[0099:BRSARO]2.0.CO;2. ISSN 0022-8443. JSTOR 20058665. ^ Elzinga, R.J. (1977). "Observations on the Longevity of the Brown Recluse Spider, Loxosceles reclusa Gertsch & Mulaik". Journal of the Kansas Entomological Society. 50 (2): 187–8. JSTOR 25082920. Wikimedia Commons has media related to Loxosceles reclusa. Sandidge, Jamel S. (2003). "Arachnology: Scavenging by brown recluse spiders". Nature. 426 (6962): 30. Bibcode:2003Natur.426...30S. doi:10.1038/426030a. PMID 14603305. Lay summary – University of Kansas-Lawrence (November 7, 2003). This page was last edited on 27 March 2019, at 17:56 (UTC).